Ah, the red pen—a staple of exemplary writing. Fiction writers, nonfiction writers, and poets alike utilize red pens to edit their work. If you don’t use a red pen, you’re certainly familiar with the backspace key and the Track Changes option on your word processor. Editing is a vital part of the writing process. You can’t have good writing without rewriting. As Patricia Fuller said, “Writing without revising is the literary equivalent of waltzing gaily out of the house in your underwear.” It’s foolish. Of course, there is such a thing as too much editing. When basic revising crosses the line into overanalyzing every single word and piece of punctuation, you know you’re in trouble. Although revising is important, it needs to have a finite end. No piece of writing can be more than nearly perfect. If you go through the same piece over and over again without stopping, you’re sacrificing time and effort better given to new projects. I am now and have always been a perfectionist. I’m rarely satisfied with my completed pieces. When editing my work, I have a hard time stopping myself. There’s always something that needs to be fixed—in my eyes, at least. As writers, we can also be our own worst critics. Our standards are different than everyone else’s. Sometimes the prose is not as bad as our minds make it out to be. Additionally, editing can turn into a vehicle for procrastination. When we’re afraid to start new projects, we waste all our time on polishing pieces that are already excellent. Sometimes we just need to stop. Sometimes we need to give up. We need to walk away. If you’re waiting for someone to tell you that your work is perfect, the wait is over. You want someone to tell you that it’s okay to stop? To move on? To start something new? That thing you’ve been editing to death is fine exactly as it is, I promise. It’s not a monster. It won’t frighten anybody. Slide it into your desk drawer, close the drawer, and go outside. Take a walk around the neighborhood. Play with your children. The world doesn’t end just because you stop editing. What do you think? 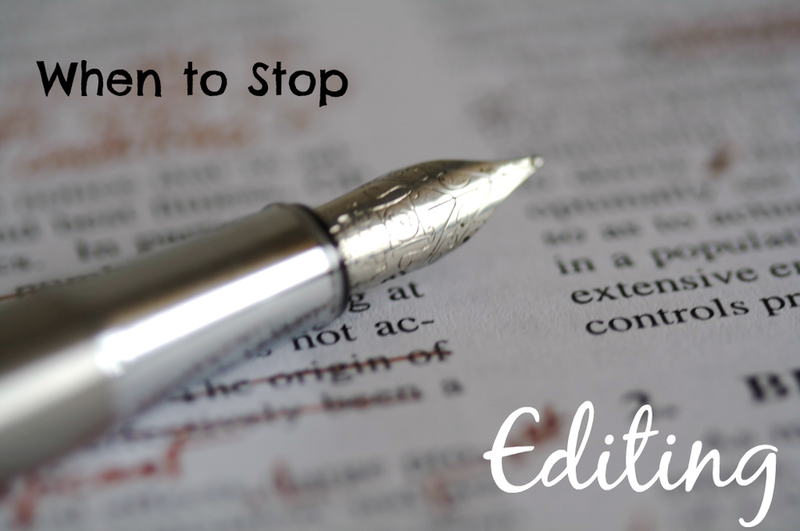 When do you stop editing?